The new "Richwood Wall", Richwood branded full colour in store solution is now available to all Richwood main dealers. The wall shows endorser Luan Parle in front of a brick wall. 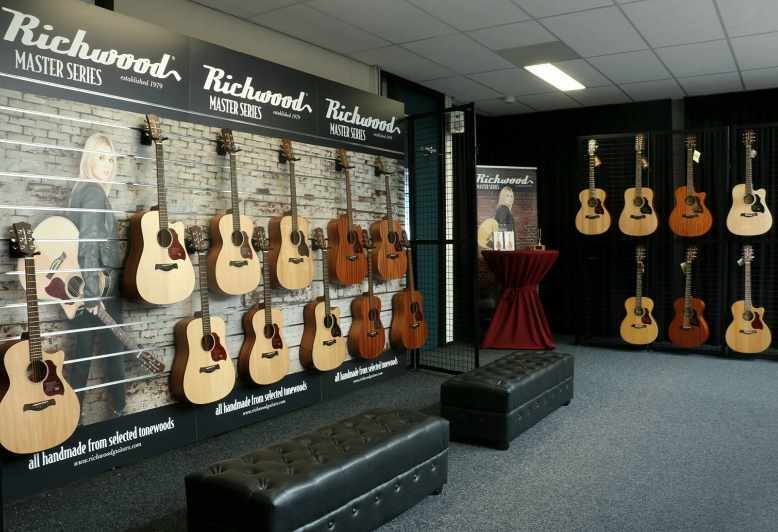 A beautiful and attractive background to display Richwood guitars and accessories in a commercial way! Besides making our guitars (even) more tempting to try, a slatwall can also lead to more sales. Do the above benefits sound as music in your ears? Why not try slatwall panels for yourself next time you want to improve your shop display area? By improving the display of your merchandise and taking advantage of the other benefits that slatwall provides, you may even be able to attract more customers and increase sales, so it is well worth looking into next time you want to make some changes around your shop. Ask your account manager for more information, conditions and discounted prices! © The Music Alliance 2019 - All rights reserved.